LOS ANGELES, CA - Actor and celebrity Will Smith is one the most bankable movie stars worldwide with his films having grossed more than $7.5 billion at the global box office. Smith has appeared on many magazine covers, including a Sports Illustrated cover, shot by celebrity photographer Michael Grecco with rare behind-the-scenes video of the two hour cover shoot. According to Forbes Magazine, Smith’s combined films grossed more than $7.5 billion at the box office worldwide, making Smith one the most highest-paid and top movie stars in the world. 17 of the 21 films in which Smith has had leading roles have amassed worldwide gross earnings of over $100 million each, with five taking in over $500 million each in global box office receipts. This has also made Smith one of the wealthiest actors thus far in his career, with an estimated celebrity net worth just north of $300 million. Forbes 2018 Celebrity 100 Earnings list ranks Smith #71, having taken home $42 million so far this year. “This was the second time I did a magazine cover shoot with Will Smith,” said Grecco. 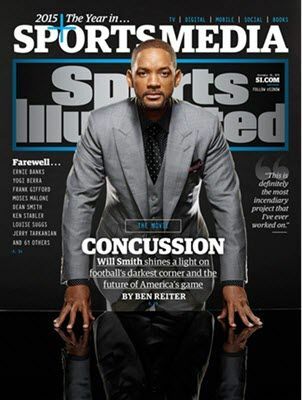 The Sports Illustrated cover featuring actor Will Smith was prior to the release of the movie Concussion. Smith played the role of Dr. Bennet Omalu, who helped discover CTE and linked it to football-specific head trauma after performing autopsies on deceased Pittsburgh Steelers players. The movie chronicles Omalu’s struggle against the NFL as he fought for the league to take notice of the danger he believed the sport presented to players’ brains. Grecco continued, “Will Smith was great to work with. He is very low key and still brings a high level of energy and professionalism, while being relaxed and having fun during the shoot all at the same time." Sports Illustrated was experiencing a hard time finding just the right photographer for this cover. The Director of Photography for SI was Brad Smith, who previously hired Grecco for many past shoots. They happened to be meeting together in New York City when the Director of Photography learned of Grecco completing a successful cover with Will Smith in the past. Grecco was immediately retained for this cover shoot. "Whenever I capture images that are fun, powerful and engage you, that is what I live for. That is what the Will Smith Sports Illustrated magazine cover delivered," stated Grecco.